Thomson owner Tui says British holidaymakers are shrugging off any worries over the Brexit vote and plunging pound as they continue to book trips abroad. 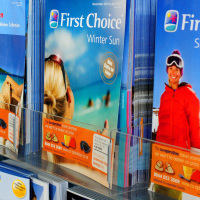 The travel giant and tour operator reveals there is a strong demand from British customers, with the UK being its best performing region over the summer season. The firm says revenues are up 5%, while winter bookings from Britain have also surged by 22%, as sun-seekers head to long-haul destinations such as Mexico and the Dominican Republic. A weaker performance in the Nordics and Germany shows overall revenues 1% higher for the summer, but Tui says bookings are 7% higher excluding Turkey, where an attempted military coup was thwarted in July. Tui says its earnings outlook for the full year is better than the company anticipated. It says underlying earnings are now set to grow by 12% and 13% over the year to September 30 - up from August's prediction for growth of at least 10%. Rival Thomas Cook also reveals robust demand from UK holidaymakers in its recent revenue update, but its sales have been hit hard in Germany and across Continental Europe, tumbling by 9%, in the wake of Turkey's woes and recent terrorist attacks. Holidaymakers visiting any destination are advised to take out travel insurance to protect themselves. Tui says long-haul bookings from the UK are up 26% so far for the winter as it switches its focus to far-flung destinations, having recently added planes flying to Cuba and Sri Lanka. It says trips to the Canaries, Cyprus and Cape Verde are also in demand as holidaymakers continue to stay away from Turkey and Egypt. Overall winter bookings are up 5%, with revenues up 11% so far. Shares lifted around 2% after Tui's earnings upgrade.